“Abraham Sends Eliezer to Find a Wife for Isaac” is a retelling of a well-known Bible story. The translator has learned about anachronism from Itzik Manger. Time to be on your way. With a bundle of equity. For an old man the internet’s hard. “Sir, have a good one,” and he goes. He walks past the traffic lights. Where the busy people press. Round her head her kerchief glows. And she moves her wings and goes. And his voice is sad and mild. Gets hidden in a cloud. און לאָז דיך איבערן לאַנד! און זי זאָל האָבן אַ קניפּל מיט געלט! װײַל דו האָסט עס אין חומש געלײנט". דער אַלטער עליעזר באָמקעט׃ "יאָ"
דער װעג איז לאַנג און ברײט. אין דרױסן דעמערט דער שליאַך. װי ס'טרעפֿט זיך אין תּן"ך. אױף די פֿליגלען פֿונעם װינט. זײַנע אױגן װערן טריב און פֿײַכט. זאָלסט פֿירן צו דער חופּה דײַן קינד". און װערט געניזוקט טיף אין טאָל. די אױגן געװענדט צו דעם שליאַך. ITZIK MANGER (1900–1968) was among the most popular Yiddish poets of the twentieth century. He was born in Czernowitz, in the Balkans, and moved to Warsaw, then to Paris, North Africa, and England, staying a jump ahead of the Germans. After the war he moved to New York and finally to Israel, where he died. His most distinctive work is Khumesh lider, a verse retelling of Bible stories, with the events reset in Galicia and the characters given feelings beyond the terse biblical narratives. MURRAY CITRON is a grandfather who lives in Ottawa. 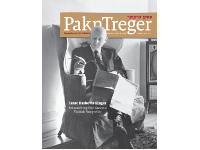 His translations from Itzik Manger have appeared in print and online in periodicals in England, Canada, and the United States, including Pakn Treger. His bilingual chapbook of Manger translations was issued in Ottawa.